A shark that only dentists can love? 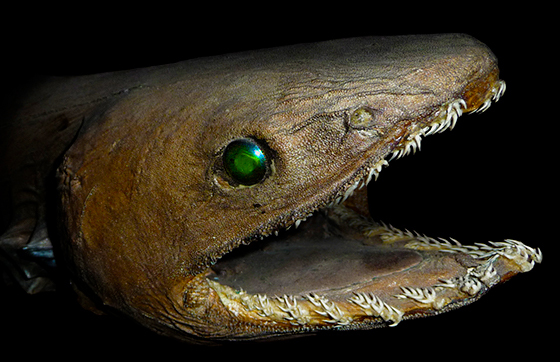 The Frilled Shark has over 300 razor sharp teeth set up in neat little rows. Whatever goes into the mouth doesn’t come back out… unless you were looking for a paper shredder. Seldom observed, the frilled shark may capture prey by bending its body and lunging forward like a snake. The long, extremely flexible jaws enable it to swallow prey whole, while its many rows of small, needle-like teeth make it difficult for the prey to escape. With its elongated, eel-like body and strange appearance, the frilled shark has long been likened to the mythical sea serpent. The head is broad and flattened with a short, rounded snout. The nostrils are vertical slits, separated into incurrent and excurrent openings by a leading flap of skin. The moderately large eyes are horizontally oval and lack nictitating membranes (protective third eyelids). The very long jaws are positioned terminally (at the end of the snout), as opposed to the underslung jaws of most sharks. The long jaws of the frilled shark are highly distensible with an extremely wide gape, allowing it to swallow whole prey over one-half its size. Read more about this nasty Frilled Shark on Wikipedia.